On Tuesday, I managed to test-draft with James Bartolotti, hubatish, Jules, and myself. This isn't the first playtest for Tesla, but for convenience I would like to call it playtest #1. Thank you for your Mecha design ideas. Your input was helpful in creating the test draft set. I could not incorporate all of the different ideas, especially since I only had time to finish the Commons. But any of the ideas are potentially seeds for future ideas. I would like to discuss them in the next few posts. This is just a rough mockup. Each type of Head and Body would have different art on the back, reminiscent of how they look in the front. The art for the top half of a Mecha could be shaped as a tank turret, a plane cockpit, a humanoid torso, etc. The bottom half could be wheels, treads, rocket engines, insectoid legs, humanoid legs, etc. They connecting portion will be standardized so that the cards can connect with each other regardless of the combination. 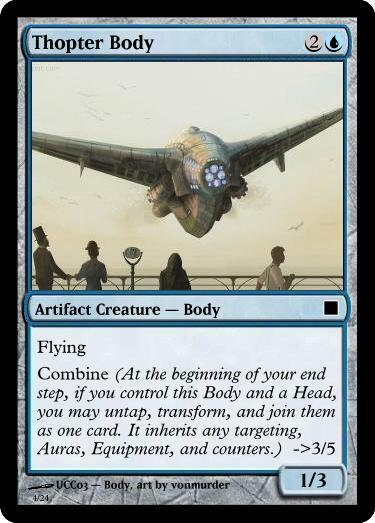 If we go with this style, we will need a new card frame template on Magic Set Editor sometime in the future. The idea for a vertical connection was proposed from an early stage, but I believe it was Nich Grayson's idea to put the joined text box on the right side. It gives you the choice to combine a Body with a Head each turn rather than only trigger when a Part enters the battlefield. If you're not sure the opponent is holding removal, you don't have to transform it right away. "If this would move to another zone, the player whose turn it is chooses which half moves there. Return the other half to its owner’s hand." "If this creature would move to another zone, instead move one half to that zone and return the other half to your hand." hubatish explains: "This way we don't have to write "disconnect and transform" which might be confusing. It also gives a tempo boost for killing a mecha, but doesn't wreck the mecha player. Keeping the rare part and reusing might be part of the appeal as well - I don't think it's too strong." 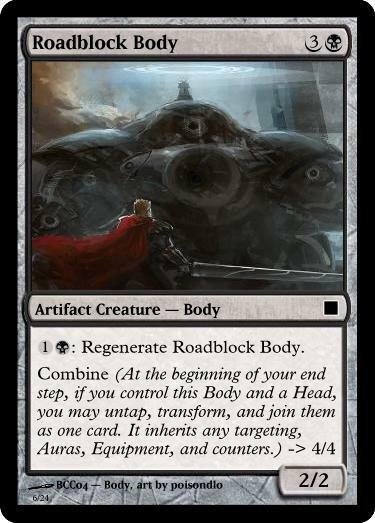 I like how hubatish's version allows the Mecha player to rebuild the next Mecha quickly by recycling whichever half that he or she needs the most. The most fun games in testing so far were games where players got to build, destroy, and rebuild Mechas multiple times. In truth we've only had one such test game so far though, so the fact that this tweak supports that kind of rebuilding is a wonderful thing. The one problem is that it allows you to recover a problematic Part over and over again. Allowing players to repeatedly play the same threat is usually not good game play. 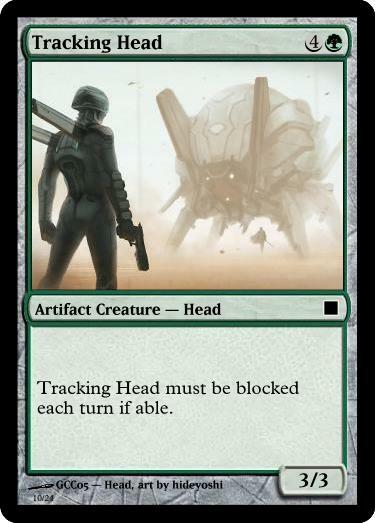 Devin E. Green had suggested an earlier version of this, where the player who targeted the Mecha with removal gets to choose which part to destroy. "Each half of this mecha is targeted individually. If either half of this mecha would change zones, transform the other half." Devin explains, "Think about it, every Giant Robot movie has a point where the main mech gets damaged and has to fight on with just its reserve power!" 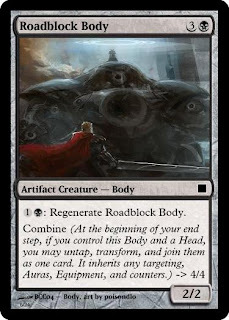 This version allows players to get rid of problematic parts with removal. 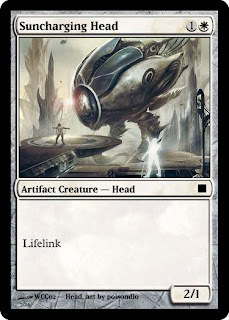 If a lifelink Head is giving an aggro weenie player trouble, that player can use removal to perform a Head-shot, and the Body transforms back. It seems fitting for a Mecha battle to have this element of selective part-destruction attacks, and the choice-making this involved seems like great game play. Unfortunately, Devin's version about targeting half of a card would probably lead to rules conundrums. It also doesn't define what happens when the Mecha dies during combat. 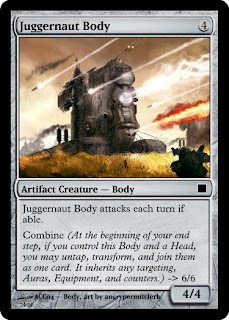 I would want the person who took the action leading to the death of the Mecha to choose which part is destroyed, but it's hard for the rules to concisely define who was responsible for the Mecha's destruction, if you consider the large number of cases such as combat damage, wrath effects, or even proliferating a -1/-1 counter. To combine the best of both of these two versions, I introduced the clause that the active player gets to choose which side becomes scrapped. To write it out again, it is: "If this would move to another zone, the player whose turn it is chooses which half moves there. Return the other half to its owner’s hand." I admit it is a weird and unintuitive clause, but I do think it leads to good game play. I am hoping that this new version encourages proactive attacking. 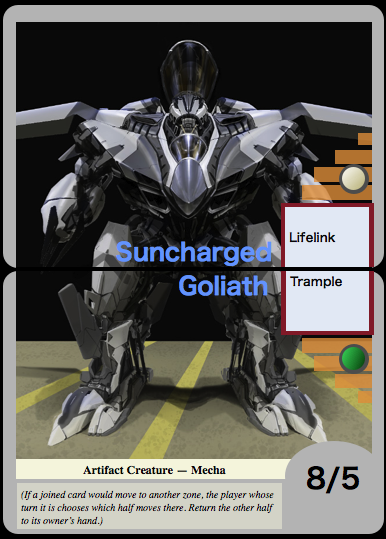 When you control a joined Mecha, you will be less afraid to send it into attack. Whether your Mecha dies to trading, a Smite, or a combat trick, you get to choose and salvage whichever part is more important. The opponent is also encouraged to attack. If you choose to hold back the Mecha for blocking, the opponent might attack into it and kill it with a combat trick, which will grant him or her the choice of which part to destroy. Players will also be able to kill problematic parts with removal just like in Devin's version, because it's not hard to use removal on your turn. Overall, this rule should usually give the choice of what to destroy to the more proactive player who deserves to make that choice. The problem with this fix is that the flavor is unclear. In that sense, it's similar to the Werewolf mechanic in Innistrad, where it's not completely clear what the number of spells cast in a turn signify. Admittedly though, the Werewolf mechanic's trigger still has a bit of subtle flavor to it while this mechanic has none. However, some of the largest problems with the Mecha mechanic is its riskiness and swinginess. It would be extremely valuable if we can make the mechanic more stable and choice-oriented, so I believe the addition of a flavor-neutral clause is worth it. Unfortunately, we weren't able to test it enough times during the draft test, but I hope to test this (as well as many other versions that were suggested) in further tests. Please let me know what you think of this version. I will also be updating on what we learned from the draft, and the potential in other ideas that were submitted. I don't like the additional complexity of having the choice depend on whose turn it is. Mecha are complex enough. As complex as Mechas are, I think the biggest problem is actually in the game play. I don't think we can just ignore the 2-for-1 problem of Mechas. Mechas are also prone to becoming a swingy, draw-dependent mechanic. Do you have another solution to these two things? We could weaken the removal and/or make the flip side bombier to be worth the risk, but that would just exacerbate the swinginess factor. While the DFC mechanic increases complexity, it also makes complexity more manageable by chunking it into two parts. Werewolves have three lines of text on the front and four lines of text on the back just from the triggers alone, and some had other abilities, even at Common. That's almost as many lines as Warp World or a Planeswalker. But despite this, it's manageable when the information is naturally chunked and you only have to read the trigger that is currently important. My objection is to the phrase "the player whose turn it is", which adds unnecessary and unintuitive complexity. I'm also not a fan of referring to zone changes, since most players don't know what that means. "When this creature dies, you choose one of its halves. Return that card to its owner's hand." "When this creature dies, choose one of its halves at random. Return that card to its owner's hand." I considered "choose one of its halves at random. Return that card to its owner's hand." But it would hold up the game with a coin flip or die roll every time, and it would also add more luck to a mechanic that already has too much luck in it. It's possible that some people might consider it a fun, tense moment, though. 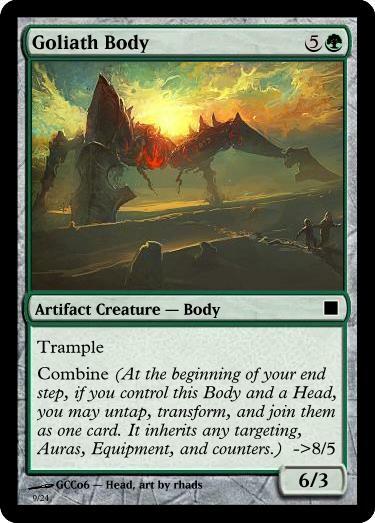 "When this creature dies" sounds much more like a real Magic card, so I see the point in it, but we also need to spell out what happens to the card when it gets hit by a Time Ebb or Oblivion Ring. I imagine it becoming very wordy. "If either half of a joined creature would move to a library, hand, or be exiled, move both halves to that zone. When this creature dies, you choose one of its halves. Return that card to its owner's hand." Do we just leave it the first part to intuition or tell players to learn how it works from an external source? I guess morph and soulbond required outside reference to really understand, but that route doesn't seem like a better option to what it's replacing. I think that returning the half of your choice is going to cause a lot of difficulty in balancing, especially with bomby Parts. - We want powerful Heads/Bodies for Constructed if possible. - The purpose of the mechanic is recombination, so it's better if we have a whole cycle of Constructed-playable Heads/Bodies to choose from. They're going to appear in Limited very often. - We need lots of cards like Gift of the Gargantuan or Faerie Mechanist to enable this mechanic in Limited. They are going to help fetch the powerful Heads/Bodies. - We might want to make Heads/Bodies more playable by giving them ETB abilities and transform triggers. In that case, recurring them would be annoying. These things are going to make the selective recursion very troublesome. Maybe we can sacrifice some of these objectives to make recursion less of a problem, but it will be costly. There is a chance that adding an activation cost for transformation will make destroying a Mecha more of a tempo hit and help balance it, though. Taking all of these things together, I think it boils down to whether we want to prioritize game play or natural-looking text. If my version caused people to be confused, then it wouldn't even be an option. But it's only unintuitive in the sense that people look at it and think "hey, that's weird." It's not unintuitive in the sense of being confusing to process. I often wonder what the Mecha mechanic is doing for the set other than just being splashy on a surface level. When I look at a mechanic like Equipment, Planeswalkers, Werewolves, Exalted or Ninjutsu, I can tell what it's doing to enrich the game or the set. Do you know what I mean? They don't just play fun in and of themselves, they add another layer of depth to the rest of the set. I think major mechanics are meant to be like that. But when I look at previous versions of Mechas, I can't tell what it's doing to enrich the game, it's just being splashy and swingy. I'm fine with that if it's just one small compartment of cards like Slivers or Arcane. 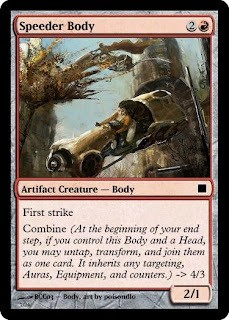 But if a mechanic is causing the whole set to bend over backwards for it, only to make that compartment of cards better without enriching or adding depth to the game play of the rest of the set in a meaningful way, that's a big problem. With the fix I proposed, we can solve the problem of randomness, excessive recursion, and unplayability. We can also make this mechanic matter to how you attack, block, or target this thing; in other words we can make the Mechanic matter a little more for the whole set's game play. This mechanic takes the entire set to support. If we don't find a reason why it adds a layer of game play to the set rather than just being interesting as an isolated compartment, then it doesn't even matter if it's simple anymore; it doesn't have a reason to exist. I don't see why the naturalness of text should take priority over game play. It's still a clean-cut and simple enough rule, just flavorless. I want to hear more about how the equipment, etc enrich their set beyond just being fun in and of themselves. Certainly, their existence helped shaped the sets they were in, but mecha are already doing that for Tesla. 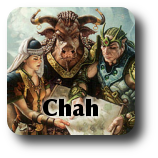 I'm not sure what Chah is talking about, but it sounds fascinating and possibly very awesome. Not to put words in Chah's mouth, but I think I'm definitely agreeing with him. But, equipment at least is easy. (That is, outside of being flavorfully fun, since everyone loves swords, literally everyone.) Equipment change the value of creatures, especially small creatures (which happen to be the centerpiece of Magic), more than almost any other card type. The fact that they are generally colorless means that they affect even more creatures, as while it's better to suit up some than others, almost any will be a combo. A Tormented Soul with a Loxodon Warhammer is probably better than a Runeclaw Bear with one, but both are allowed to be fun. The fact that they change the tempo of the game, with separatable payments for playing and equipping, means that the curve of the format can be differently balanced or controlled (see Innistrad). How much they affect board states and card evaluation is usually balanced out by the fact that A: there are not that many of them and B: they are fun! Planeswalkers also are fun and flavorful for all the obvious reasons, but they also enrich gameplay by again putting a focus on creatures as a primary means of interaction. One of the other things they do is allow you further choices and actions on turns when you draw blanks, but that's just friendly (and powerful) design. Werewolves, being creatures themselves, don't necessarily bring creatures more into focus, but they do combo on both sides of the board with every spell that you cast in the game. Every spell both players cast can affect Werewolves, in addition to the interaction they have with things like Equipment or Planeswalkers (which allow you to invest in things without casting a spell). The translation I think that needs to happen is that Mechas could use an additional layer of interaction without adding considerable extra weaknesses. Glacial Ray may want additional Arcane spells, and a Mecha may play well with Faerie Mechanists, but neither one cares altogether that much about a Runeclaw Bear. Werewolf played on its own, Flashback played on its own, but the two intersected in very interesting ways. Is there anything we can design that can intersect with Mecha in an interesting way? And of those things, can we find one that would be interesting/fun/stands-well-on-its-own? Thanks, Pasteur, you took the words right out of my mouth! So Werewolves made us care how many spells were cast in a turn, and Flashback layered onto that by helping us cast more. What do Mecha make us care about? Tutoring/filtering? Pairing up card types? Protecting pieces of a combo? Big things? We could use cycling to help players work toward their combo, or headcycling and bodycyling to, um, make us throw up in our mouths a little. If we did bring cycling back, we shouldn't evolve it directly since there's only one set in the block, but we could let it combo in some new way. Maybe lots of "whenever you draw" and "whenever you discard" effects? We could take some cues from Rise of the Eldrazi for slowing the game down long enough for people to assemble their mechs. Defenders could fit the theme if we're fighting giant monster/aliens. There's been almost no mention of a "lands-matter" theme, but let's imagine there was one. If you have Landfall, or something like it (since there's other space to explore there), you could also have a variant on Dig. Imagine "cascade until you hit an artifact or land, then put that into your hand". If the mechas have a sort of "buried technology amongst the ruins/in a post-apocalyptic landscape", you've got a smoothing mechanic that can also help you find heads/bodies. But while that's functional it's not especially exciting. If the keyword we end up using for the Mechas is more open-ended/modular/similar to Soulbond, that could justify it being used on some colored creatures in interesting ways and on Mechas in one consistent way (like how werewolves shared a trigger but other DFCs existed in parallel). 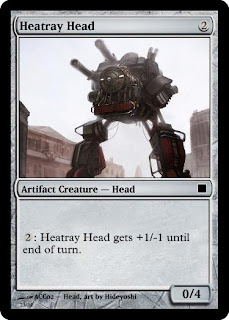 Another option would be Mechas that can be assembled and noncreature contraptions that can also be Assembled, just to help offset the weight on the set. 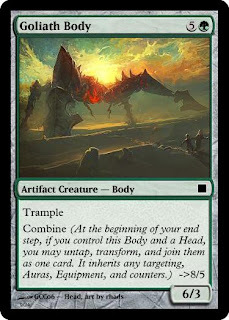 What if all the Mechas were bodies that you Operated (somehow, probably involving tapping a creature and/or paying a mana cost in some way) to transform them? DFCs still have space for us to explore, and if it *is* a post-apocalyptic set, there's all sorts of weird transformations and things that can be displayed for non-artifacts. In general, front-side-defunct/back-side-powered-on could be interesting space to explore with any number of artifacts, and *maybe* some/a lot of the backsides specifically combine together in some way to be arms/legs/cool-fighting-robots. 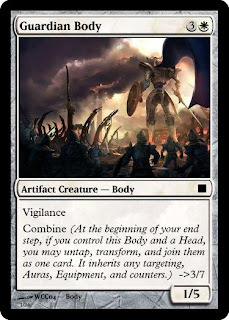 Something like Exalted (maybe Exalted itself) could emphasize combining your cards into one bigger threat/the one-on-one nature of monster vs. robot (which has parallels to but is a far cry from Bant's sigiled duelists). It's probably not enough but it could play a role if DFCs don't take up the returning-mechanic slot. If the Mechas turn out to be big, stat-overriding Equipment, then seeing am even stronger "equipped" theme than we've seen before isn't out of the question, but we do seem to be leaning away from that. Fortify is something we could try out again? It's another "lands and artifacts" bit, and you could even potentially have missile-defense-esque fortifications alongside DFCs. Head probably needs to be a supertype, otherwise what happens if I turn my Werewolf into a Head creature somehow? Changelings ruin that too. 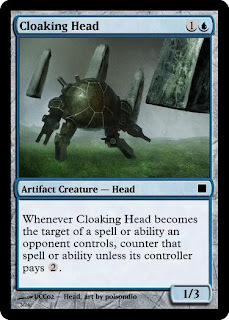 Could be a supertype, or we could just reference "artifacts with Head" provided we make that a keyword. So... supertype? Head and Body can just be artifact types. Supertype is probably the easiest answer to the problem. I'd vote to revisit the Alpha/Omega names to make it more flavorful than Head/Body. Mirrorweave could foil both keywords and supertypes. I guess we just have to introduce a term to mean "join them transformed" and the rules say that you ignore that effect if the backside isn't a B.F.M. card. That's similar to how token copies of DFCs work; transform is ignored for those. @Nich: Can an artifact creature have artifact subtypes, or does its creatureness lock into only having creature subtypes? Is the answer moot if only 1% of players will understand the difference? Introduce a term to mean "join them transformed", hm? Maybe... assemble? @jay Honestly it's something WotC hasn't had to have to do. The only example I give of a card with two card types with two subtypes is Dryad Arbor. Its a Land Creature - Forest Dryad. There's no reminder text saying Forest is a land type and dryad is a creature type. It relies on player knowledge of those subtypes from previous cards. I like Head/Body being artifact types because it prevents unwanted interactions in formats with Mistform creatures or changeling without drawing unnecessary attention in the current format. But the only way to establish that is to have examples in Tesla of Head/Body artifacts in the set that AREN'T also creatures. 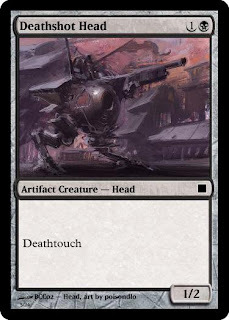 The rules faq would say two new artifact types have been introduced (Head and Body) and one new creature type (Mech). why [u]do[/u] the flipped side of mechs have to be creatures? couldn't you have an equipment that turns into a head? land that turns into a body? wow that's a lot of design space probably not worth delving! For changelings I think some kind of simple "if" clause to make sure that the head you're targeting actually transforms could work: "At the beginning of your end step, if you control a Head, you may transform it. If you do transform this and untap both creatures, joining them as one card. It inherits any targeting, Auras, Equipment, and counters.)" Creatures that already transform were my biggest concern. The rules can then handle what happens if you try to Combine a Body with a cloned Head or a changeling werewolf (i.e., nothing happens). 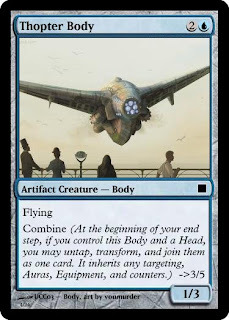 I also want to say I support trying one of the halves as non-creature artifacts on their front face, so you don't have to worry about the card dying before you can Combine it. why not: "If this would leave the battlefield, the player whose turn it is chooses one half. Return that half to its owner’s hand."? "chooses which half moves there." ---> "chooses one half"
"Return the other half to its owner’s hand." ---> "Return that half to its owner’s hand." That's a great improvement of phrasing if we go this route. However, many players might think that this is replacing the movement, and not understand that the half that is not chosen still moves to where it was moving. "As this leaves the battlefield, the player whose turn it is returns half to its owner's hand."? I was about to post the same one as Jay. But reading it over, somehow the intent of the mechanic seemed obscured, even though the mechanical way it worked was clear. It should sound like you get to choose which part to hit with the exile, destroy, Time Ebb, or bounce effect. It shouldn't sound like you choose which part to save, and let the other side get hit (even if it's functionally the same thing). I feel like this really affects whether people will get the mechanic at first read, and that's more important than sounding like normal Magic text. The way that B.F.M cards work with zone change effects has to be defined by the Magic rules, not by the card text, because card text can be wiped out with cards like Humility. So if we do this, we should put the explanation on zone-change in parenthesis; it will only be a reminder of the actual rules that are making it happen. If it's in parenthesis, it should be ok to use non-standard text, so we should try to maximize communicating the intent that you get to choose which side to get rid of during your turn. 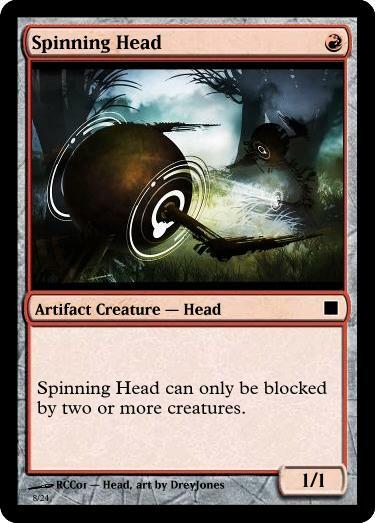 This would better communicate the mood that "you get to choose what to destroy on your turn" on first read. This hasn't been mentioned yet, but I think it's funny that, in multiplayer, Player A can destroy Player B's mech, but Player C gets to choose which half dies just because it happen during her turn. I agree that we need an extra sentence to denote that the other half goes where intended. I thought of that after I posted the wording. this will all have to be in reminder text of course. also it is much better worded as... "If this would" or "Whenever" so that it works in the rules like a triggered ability just like many other important functions of the game. also, yes, in reminder text you do not need to always use exact rules text. but you should stay really close so that you don't confuse players familiar with magic English. I don't think that's horrible since if Player A really wants to destroy a certain part, s/he could do it during his or her own turn. I do see the flavor disconnect though. T: ~ deals 1 damage to target attacking creature without flying. T: ~ deals 2 damage to target attacking creature. It doesn’t untap during its controller’s next untap step.